Shhh! Don’t tell anyone, but I kinda love to brainwash my students. I tend to think that if they repeatedly hear positive thoughts about academic endeavors, they absorb them and begin to think of those positive feelings as their own, if they weren’t already. Hence the theme of this I Heart Math game. 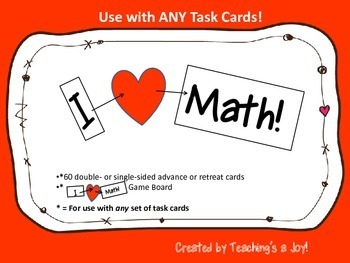 The advance/retreat cards and game board can easily be used for any set of task cards. Use them often, and brainwash your babies! Note that this product is included in 5.3H Adding and Subtracting Fractions with Unlike Denominators!